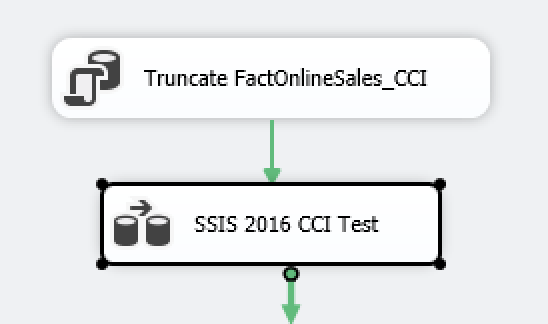 I have written previously about SQL Server Integration Services and their interaction with Columnstore Indexes in Columnstore Indexes – part 51 (“SSIS, DataFlow & Max Buffer Memory”), but for a long time I was looking to revisit the chapter of the communication with SSIS because of one important improvement that we have received in SQL Server 2016 – the better possibility to control the amount of of memory available to the DataFlow buffer. 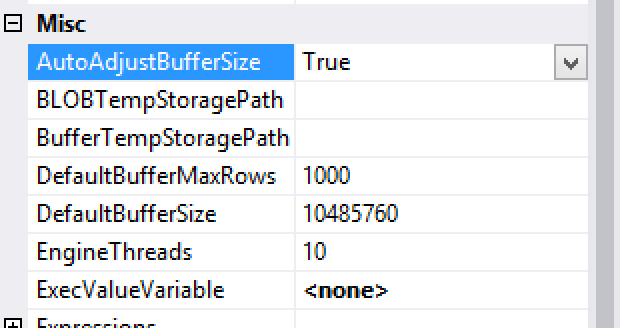 Summarising the biggest problem of SQL Server 2014 in relation to SSIS & Clustered Columnstore Indexes was the fact that we could not allocate more then 100 MB per dataflow buffer, thus potentially limiting the actual size of the row groups, should 1048576 rows need more than 100 MB of RAM. 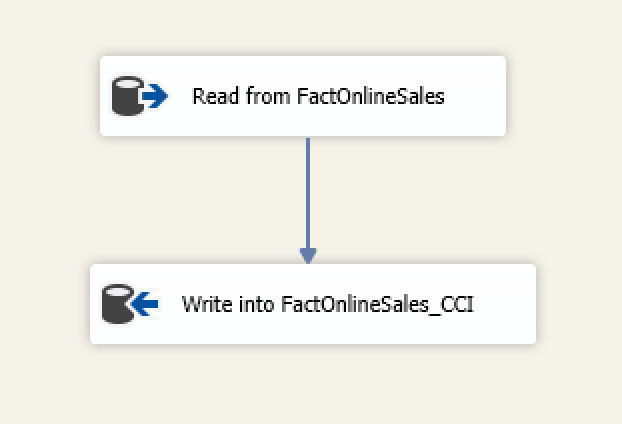 In SQL Server 2016 we have an option that allows to auto adjust the size of the data flow buffer, and together with the setting for the default dataflow buffer max rows we can control what we need to make columnstore work. 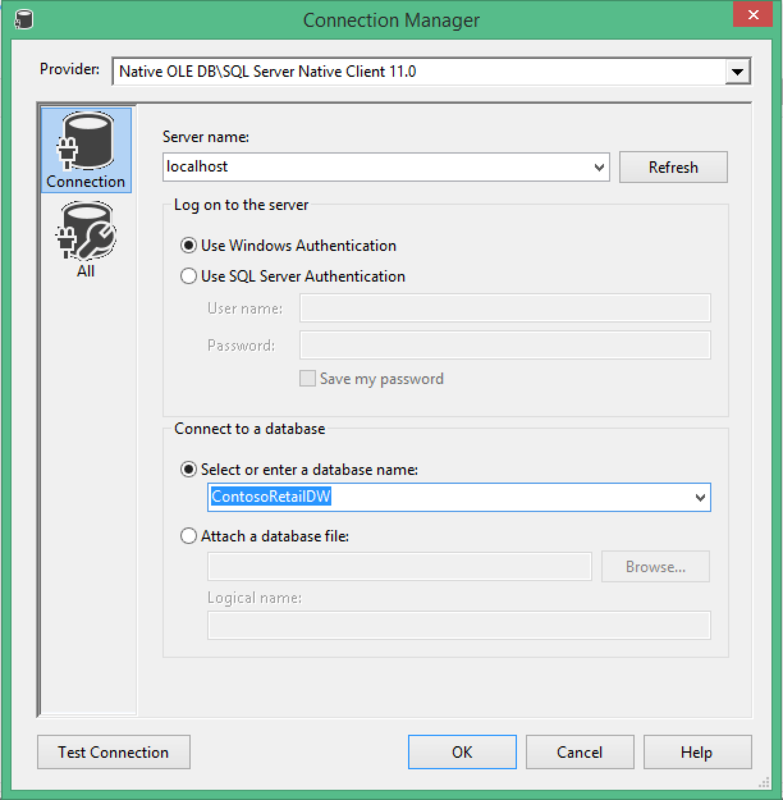 For the data loading you will need to have Visual Studio and SSDT installed – I will be using Visual Studio 2015 for the purpose of the test, but to my understanding those settings should function in Visual Studio 2013 as well. The default settings execution took nothing less then 5 minutes and 34 seconds on my test VM. For ~12.6 Million Rows that’s a recipe for a total disaster. This result shows that we have not received small Row Groups, which would require us to rebuild the table/partition – and these are definitely good news, but the speed is of the operation is something that leaves the desire for further improvements. With 4:35 Minutes this result was a rather small improvement. Of course you will need to add at least 15 seconds per each of the Row Groups, so the efficiency of this method is very questionable. 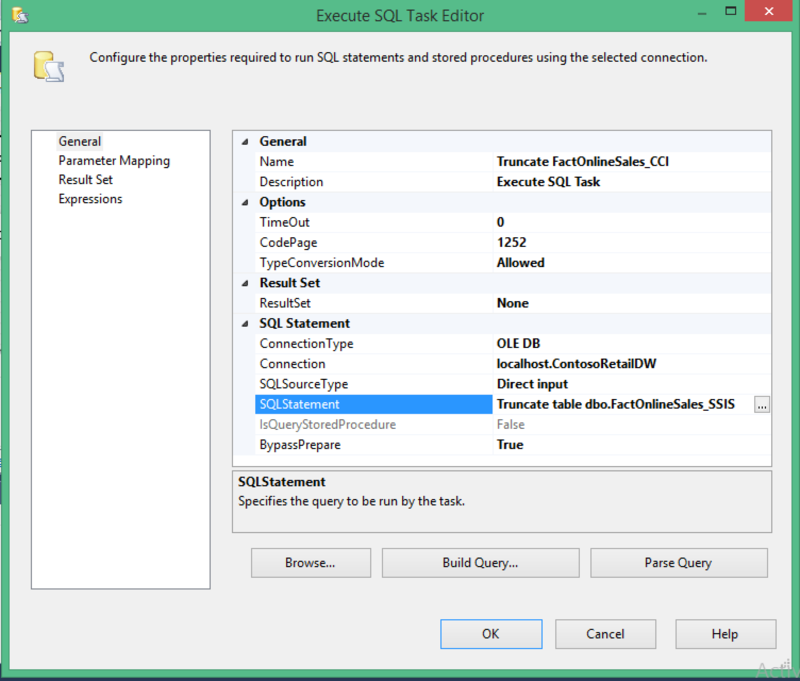 Keep in my mind that any internal pressures such as memory (when you do not have enough to process a Row Group) or the dictionary pressure (this is what you see if you put a lot of very wide strings into your fact table) are something that takes place on the engine level and can’t be controlled from SSIS or T-SQL. 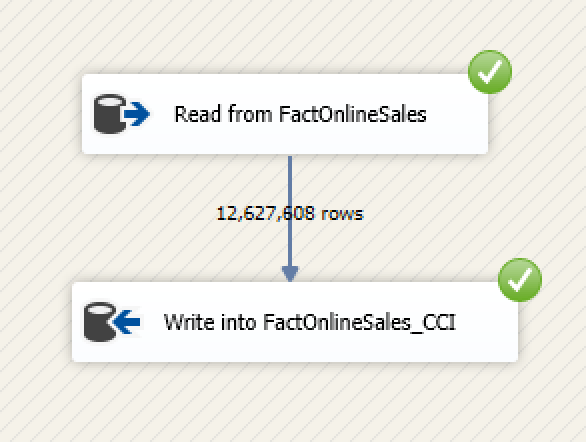 About the SSIS loads, do you have a comparison vs a ‘known’ minimally logged/bulk api load of the same data? eg bulk insert or BCP? Out of interest, what did you set the max insert commit size to? And does turning on minimally logged inserts (TF610) have any effect? How are inserts into a clustered columnstore logged? Specify the number of rows in a batch. The default value of this property is –1, which indicates that no value has been assigned. Clear the text box in the OLE DB Destination Editor to indicate that you do not want to assign a custom value for this property. Specify the batch size that the OLE DB destination tries to commit during fast load operations. The value of 0 indicates that all data is committed in a single batch after all rows have been processed. A value of 0 might cause the running package to stop responding if the OLE DB destination and another data flow component are updating the same source table. To prevent the package from stopping, set the Maximum insert commit size option to 2147483647. 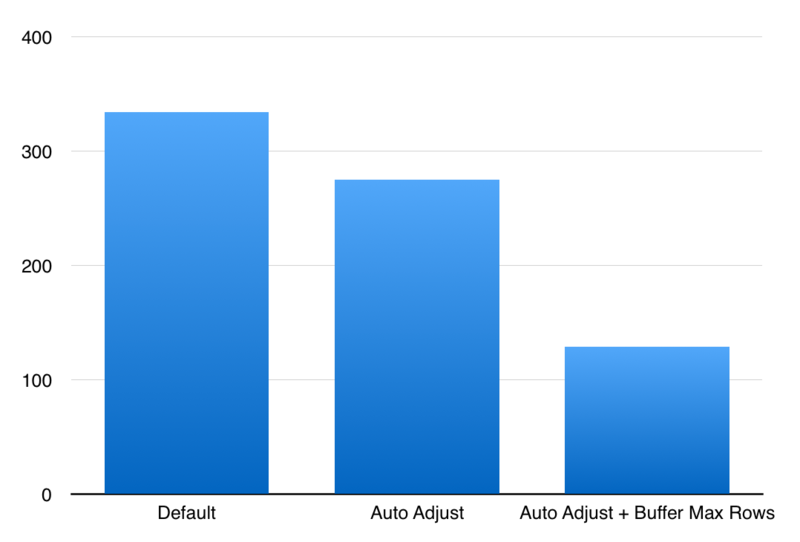 If you provide a value for this property, the destination commits rows in batches that are the smaller of (a) the Maximum insert commit size, or (b) the remaining rows in the buffer that is currently being processed. ^^^^^ that ‘remaining rows’ is the smallest of ‘rows per batch’, and the defaultbuffermaxrows/defaultbuffersize settings.